It has been a while since I updated about how we are coping with Bubbles' eczema. I am pleased to share that the SEC Shower System is still working well for us. Bubbles still asks for her showers, and has said several times that the shower makes her skin feel better. This is a sharp contrast from her daily painful refusals before we had this system installed, and a relief to us. Unfortunately, while the shower, cleansing and moisturizing routines help to provide some comfort and relief to her, we were still not getting to the root causes of her eczema. We already did what we could to reduce her exposure to dust-mites that she is supposedly allergic to, but flare-ups were still happening. 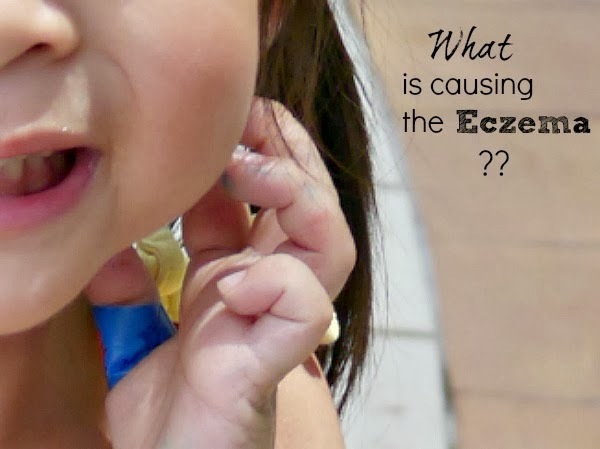 Just WHAT is causing her Eczema and extreme discomfort? I was driven to find some answers. Not satisfied with having to rely on steroid creams every doctor we saw prescribed, I located a Naturopath/Osteopath in Singapore who is a NAET licensed health practitioner. Quite surprisingly and slightly alarmingly, at our first visit, the naturopath we consulted with detected several food sensitivities/allergies in Bubbles - gluten, chicken, eggs and milk! I flipped as most of those things featured in her daily diet. I asked why these food allergies were never detected in any of the three skin prick tests that Bubbles went through. He explained that regular skin prick tests detect proteins, but in her body, the amounts must have been too little for the proteins to be traced. Despite that, the tiny amounts were likely enough to trigger her eczema. For relief of itch and to heal rash wounds, we were advised to give her regular salt baths. We simply add spoonfuls of sea salt into a tub of water, and let her soak in it. Sometimes, we do this just for her hands, as the itch and inflammation there affects her a lot more, given that we use our hands for almost everything. Damage to the Gut | He also explained that in natural medicine, it is believed that the gut is the wellspring of life, so to speak. It is sometimes called the "2nd brain". In Bubbles case, her food allergies from birth must have caused quite a bit of damage to her gut, causing it to inefficiently absorb nutrients, and contributing towards the eczema. From his diagnosis, he also said that Bubbles has more of a vegetarian constitution, and recommended that she increase her vegetable intake, and reduce her meat consumption. The information we heard that day was a revelation to me. Despite feeling overwhelmed, I also felt a tremendous sense of relief, thinking that we have finally been given some answers. We plunged head-on into changing Bubbles' diet, eliminating first chicken and eggs, and gradually cutting out milk and gluten by the end of that first month. I will not pretend that it was easy. It was very, very tough. Tough on the poor girl of course (bless the little one! ), and also on me, as I had to completely overhaul the family's usual tried-and-tested, easy-to-make meals. Besides food experimentation, there was a lot of tears, stressful grocery shopping trips, worries and struggles. However, we were rewarded as within 2-3 weeks, her skin noticeably cleared and showed a natural plump moistness. Her hair too became more silky, and less dry than before. The eczema did not completely go away, but the condition of the skin was definitely improved, the first time without any medication at all, and she was also much cheerier, perhaps from less discomfort. Most tellingly, a couple of weeks into this new diet, I pointedly asked her if she felt any different. Her verbatim reply was: Yes! My brain used to be stuck, but now it is unstuck. I believe this is due to the reduction of gluten in her diet more than anything else, but felt thrilled that my then almost 4-year-old could clearly articulate this! Sadly, and frustratingly, her eczema has flared up again in recent days. We have quite religiously stuck to the diet, so we do not know what is going on. Could it be the additional dust exposure from getting our air-conditioning units cleaned recently? Or that our apartment block is getting a new coat of paint these few days? I really don't know, and am quite depressed that we seem to be back at square one despite all our efforts. Anyway, we are currently awaiting the results of a detailed stool analysis that the naturopath suggested that we do. We had to go to a different clinic to seek a consultation about this, and found out that such a test cannot be done in Singapore! Stool has to be sent all the way to the USA to be tested. I found this fact, plus the fee to get it done, quite incredulous! We went ahead anyway, as a detailed stool analysis could really be the key in getting to the root causes of Bubbles' health issues. I will share more about how this test has been helpful (or not) for us, once I get more information. For those of you who may be interested in naturopatic health methods, and who are Christians like me, it may be useful to read articles from this site, especially this and this. I wish I read these before we embarked on NAET, but now that we have already gone ahead, I am more prayerful and cautious about next steps, and continue to pray for healing and protection for Bubbles. That was very interesting to learn about! I've never heard of NAET. I hope the outcome of the stool analysis sheds more light on Bubbles' condition and how you can better manage it. Very interesting! Noah's eczema has really flared up here in Melbourne due to the weather, and I've just gotten a baby moisturiser here for him. Will let you know if it works. It's extremely thick and sticky, compared to what I previously used, but maybe it works well for this dry and cold weather. Hope Bubbles feels better soon. Hi, my 6 yrs old has started her Naet treatment for ezcema. She's on her 3rd treatment. We do see slight improvement but sadly sometimes certain triggers can set us back again. It will be a long committement, time and financially. We need a lot of patience, sometimes I wonder why she has to suffer like this. It's a roller coaster ride for me especially mentally. We have seen so many docs, specialist but we know there's no cure for eczema. Just hope one day she will grow out of it, right now we just have to learn to cope and control. Yes, I never heard of NAET prior to this either! I certainly hope to continue learning more about what could help Bubbles. But there is so much information to grapple with - many conflicting views even amongst healthcare practitioners! Oh dear, sorry to hear about the flare up! We recently tried an Australian brand called MooGoo. It has rave reviews but I think might not have worked so well for Bubbles has she has milk allergy! I am so sorry to hear about your experience! I really do understand what you say there is a need for patience, and that mental roller coaster ride is very familiar to me too. Thanks for letting me know that your 6yo has tried the NAET. I only know one other person who has done it, and quite successfully. It is heartening to hear of another! We have no idea what are her triggers. Is this NAET thing very costly? When we look into the medical science so we come to know that Eczema is a hereditary cause and even of the parent do not have the disease so any of the ancestors of the parents would have the disease due to which the child is having this but Physiotherapy North Ryde can help as well by giving some therapy at the selective points of the body. Hi there, my lo is also having eczema, I guess her condition is not as serious as your daughter but it hurts to see her not being able to sleep well due to itchiness. Hope your lo have fully recovered and share more on the treatment. TIA! I'm wondering if you can share the name of your naturopath Doctor in Singapore? I would like to see a Doctor like this for check-ups for my 4 girls and myself (we are living in Indonesia teaching at an international school). My e-mail is mktebbe@gmail.com. Thank you for any help you can give me with this! Blessings - and I DO hope you get to the root of your child's eczema!